Since the last general elections, when, for the first time in our 57 year history as an independent nation, the ruling UMNO-led coalition lost the popular vote, the government has been getting more and more paranoid and increasingly fearful of the people. Just how fearful they are can be gleaned from just one day’s worth of recent news reports. You know the government fears its own people when they engage in scare-mongering and racist propaganda. According to them, the Malays are under threat and are in danger of losing power, losing their faith, losing their culture, losing their language, and so on, ad nauseam. 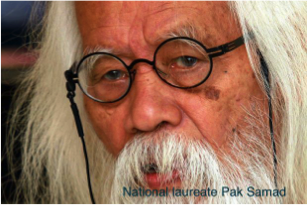 As national laureate Pak Samad Said [right] said recently, if after 50 years of UMNO rule, the Malays are still so vulnerable, UMNO should accept that its policies have been an utter failure and should step down. You know the government fears its own people when they try to intimidate our students into silence, lock them out of their campuses, threaten to expel them or terminate their scholarships and allow thugs to disrupt their meetings. Repression, however, has simply awakened a new generation of Malaysian students to the injustice that abounds in our nation. You know the government fears its own people when the Election Commission carries out a boundary delineation exercise furtively. Malaysia already has one of the most skewered electoral boundaries in the world. The pro-government Putrajaya parliamentary constituency, for example, has a mere 15,800 voters while the opposition Kapar parliamentary constituency has 144,000 voters. As a result of gerrymandering, the ruling party needed only 47% of the popular vote to capture 60% of parliamentary seats in the last general election and thus perpetuate its dominance. Only a government that fears the verdict of its citizens resorts to this kind of chicanery. 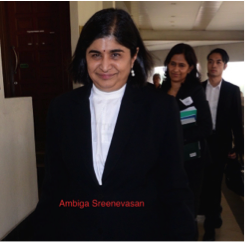 You know the government fears its own people when it bans a highly respected former Bar Council president [Ambiga Sreenevasan, left] from visiting Sabah, one of Malaysia’s thirteen states, to participate in a civil society roadshow advocating moderation, peace and harmony. When citizens can’t travel freely in their own country, it is sure sign that the government is afraid. You know the government is afraid of its own people when it spends millions of dollars to jam a small independent radio station that is critical of corruption, mismanagement and the abuse of power. Expensive jamming equipment has forced Radio Free Sarawak off the air before anticipated snap elections next year. You know the government is afraid of its own people when it starts arguing that human rights must have a Malaysian “mould.” A Malaysian mould is another way of saying that our rights to freely speak, assemble, believe, and think must be limited in the interest of preserving the ruling party’s stranglehold on power, that we must look the other way when gross injustice is perpetuated or when crooks pretend to be patriots. Freedom empowers citizens; restrictions empower governments who are afraid of the people. You know the government is afraid when it harasses and intimidates a wildly popular and much loved political cartoonist, investigates him for sedition and bans his books. 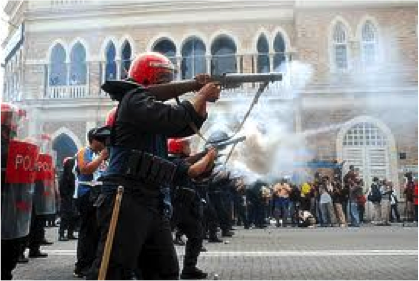 Citizens in democratic Malaysia are apparently not free to laugh at their government’s foibles. Let the government fear the people for the people no longer fear the government; and that is the beginning of freedom in Malaysia.